According to the United Nations Refugee Agency, about 42,000 migrants arrived in Europe this year as of Jun. 30. The number of migrants entering Europe have reduced in comparison to previous years. Courtesy: Laura Verduci/Doctors Without Borders. 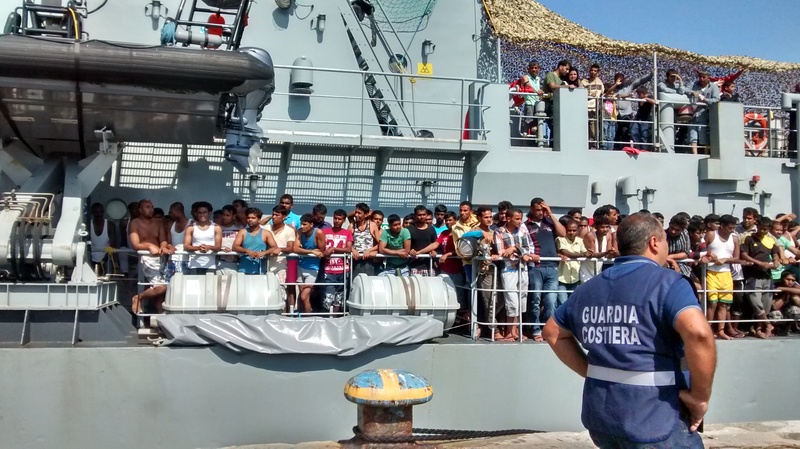 ROME, Jul 10 (IPS) - Debating on migration as an emergency is a huge mistake and treating it as such opens the door for illegal and unfair activities, says a migration expert. Laura Verduci, a humanitarian officer who has worked with migrants both in Europe and Africa for more than 20 years, tells IPS that she has seen migrant emergency funds being squandered or embezzled. Verduci, who currently works for Doctors Without Borders and is now based in the West African nation of Sierra Leone, says: "Once you consider it as an emergency, this implies the allocation of extra resources … I realised during my experience in Sicily, that they are subcontracted to private entities that bring the entire process into illegal and unfair activities." According to the United Nations Refugee Agency, about 42,000 migrants arrived in Europe this year as of Jun. 30. It may still be early to compare this with last year's figure of about 172 000 migrants, but if the overall migration in previous years is anything to go by the numbers seem to be decreasing from a high of just over one million migrant arrivals in 2015 to almost a third that in 2016. In comparison to Europe's total population of about three quarters of a billion people, some see this as a drop in the ocean and not an emergency situation. The reduced numbers do not explain the long delays many migrants experience. In Italy, most migrants are still trying to obtain political asylum or, in some cases, be included on official asylum lists. A cultural mediator who works in a refugee centre in the north of Italy and wanted to speak anonymously, tells IPS that in some cases the bureaucratic procedures to obtain asylum in Italy are intentionally slowed by authorities in order to prolong the residence time of migrants in those centres, purely for the allocation of public funds. The International Press Foundation has previously reported on the issue. Verduci has experienced the wasteful spending firsthand. "I remember while I was working in Trapani, that we had to wait for slippers for migrants that were purchased from a supplier in Messina, which is on the other side of Sicily. We could buy slippers anywhere close to Trapani but the had been subcontracted to that specific seller," she tells IPS. Last year, an Italian court convicted 41 people, including personalities and politicians both from right-wing and left-wing parties, for stealing money from public contracts. The Mafia-like system used intimidation to win contracts in Rome. The racket controlled many municipal services, such as rubbish collection and management, public spaces' maintenance and refugee centres. The investigation revealed that most of those financial resources were never spent for what they were intended — to improve living conditions in the refugee centres — but were siphoned off. "I can see clearly a link between criminality and some political parties in Italy," says Verduci. Italy's current interior minister Matteo Salvini is said to have had his campaign funded by Giuseppe Scopelliti, a former politician who law enforcement authorities have claimed is deeply involved with the ‘Ndrangheta', the criminal organisation that controls the cocaine trade in Europe. It is alleged that Scopelliti and other controversial personalities attended Salvini's rallies. "Those criminal organisations are interested in prolonging the economic and social uncertainty of migrants who, if unemployed and isolated from society, risk to enter into illegal activities," says Verduci. Verduci refers not only to the alleged links between criminal organisations and Italian politics but also to the more transnational aspect of human trafficking that has been taking place between Libya and Italy. There have been reports in the media accusing the previous Italian government of striking a deal with Libyan militias involved in human trafficking to stop migration flows to Italian shores. The government had denied the reports at the time. But it was reported that after the alleged agreements were made, migrants arrivals dropped significantly. Analysts like Den Boer from the University of Kent and Valerie Hudson from Texas A&M University believe that it would be a mistake to consider only the benefits of migration, which also brings some negative effects if not addressed with the suitable policies. There is also the risk that migrants could remain trapped in a limbo of inadequacy in European societies if countries do not offer suitable integration policies. Migrants, if forced to live in poverty, without the chance of gaining employment or an education, risk being exploited by criminal organisations.